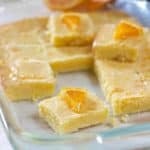 A super easy and flavorful ooey gooey orange bar! Spray 9 x 13 pan with non stick spray. Add flour and salt and beat for another 2-3 minutes. Pour into prepared pan and bake for 30 minutes or until edges are brown and top is just starting to brown. Cool for 10 minutes. Using a fork, poke holes all over the cake. Combine glaze ingredients in small bowl. Spread over warm cake. Let cool before cutting. Chilling in the refrigerator for 30 minutes makes them a bit easier to cut.